In this interview with Rehman Bunairee of Deewa (Pushtu) television, the author is asked about why the Pushtun Tahafuz Movement has been censored in Pakistan despite holding big rallies across the country. Her answer, translated on the spot in Pushtu, states that the size of the rallies has brought newspaper outlets to cover the event. According to her, the PTM’s push for democratic rights including the right to be brought to trial instead of being “disappeared,” has raised public awareness. At the same time, the censorship of their rallies is a mark of the authoritarian style of governance in Pakistan that does not like to be criticized. 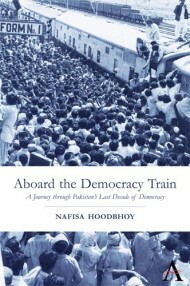 The author speaks about her presentation of the expanded edition of her book, `Aboard the Democracy Train,’ before the intelligentsia in Peshawar University in 2016. That event, she says, helped to expound on the events that occurred after the military operation of 2014, and which fueled suspicion about the relationship of the military with extremist elements. When asked about the division of the media on ethnic lines, she says that journalists are also human beings and therefore personally influenced by the events around them. However, she says that a good journalist needs to rise above personal biases to present the situation with clarity.